Not only did Hank Crawford play baritone and alto sax in the band of Ray Charles, he also was its director from 1959 to 1963. Much of the charm of Charles’ legendary working band and recordings such as Atlantic’s Ray Charles In Person lay in the exquisite, soulful and gospel-tinged arrangements of Crawford. The Ray Charles band was admired by both the r&b audience and jazz world. Both during and after his tenure with Ray Charles, Crawford recorded a magnificent string of albums on Atlantic in his own right, that crossed boundaries between jazz and r&b. 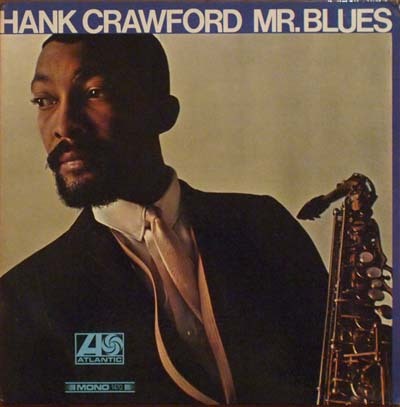 Mr. Blues is Crawford’s eight release on Atlantic. Taking into account soaring solo’s like the one in Percy Mayfield’s blues ballad Danger Zone, the designation ‘Mr. Blues’ is duly justified. Paradoxically, however, the two most straightforward blues tunes are the weakest links on Mr. Blues. Both the title track, on which Crawford makes a piano appearance, and Lonely Avenue, are formulaic. Usually, what jazzmen do with the blues is adding something like an extended bar pattern, a turnaround, a peculiar rhythmic figure or tag ending. Crawford doesn’t add anything special to Mr. Blues and Lonely Avenue. The tunes also suffer from rather crude guitar solo’s. Crawford’s version of Lonely Avenue does not lack energy but the excitement of Ray Charles’ 1956 hit performance of Doc Pomus’ composition is far away. However, it’s incorporating blues ‘feeling’ into jazz in a sophisticated manner, instead of playing blues matter-of-factly, what makes Crawford’s approach special. A good example is On A Clear Day (You Can See Forever), which contains suave horn voicings behind Crawford’s alto horn, followed by a jumpin’ and rockin’ unisono horn part; a method that succesfully makes a small group of four horns sound very big. Tunes like this – waltz blues Hush Puppies, a shuffle version of Bob Troupe’s Route 66 and the ballad Teardrops – that combine the anguised, vocal-like style of Crawford with his tough arrangements are utterly irresistable. There’s also nothing wrong with the third and fourth Crawford originals that round off the album: Smoky City is an uplifting piano boogiewoogie and The Turfer is a blues with a boogaloo rhythm that sounds like an edgy back-up track for Otis Rush or Magic Sam. Hank Crawford’s crossover endeavors were fundamental in keeping jazz vital. Mr. Blues may not be Crawford’s quintessential Atlantic album, but it definitely does the job.